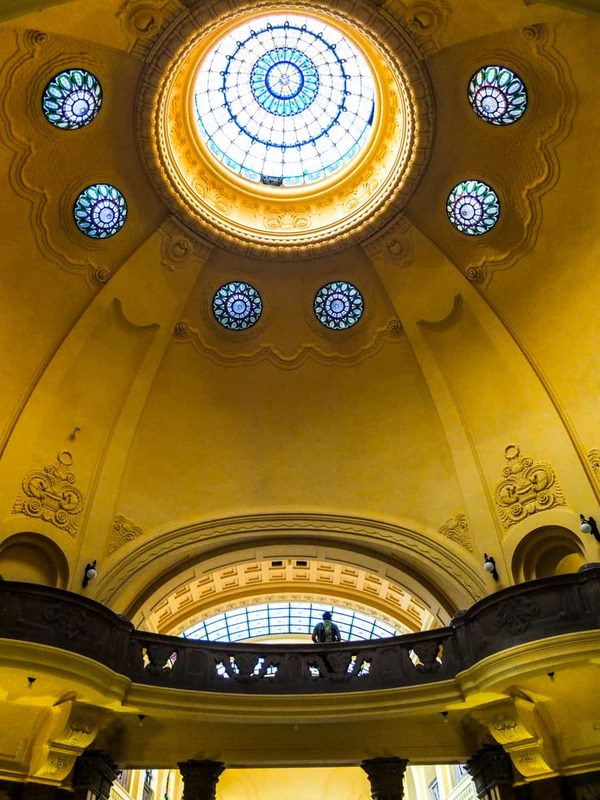 the magnificent Gellért baths in Budapest. I am a water baby (albeit an elderly one). In a previous life, I’m sure, I was a hippopotamus. 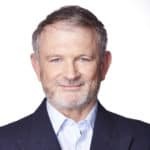 I don’t function each day until I have spent some time immersed in water – even it is just is being doused under a shower or splashing around in the bath (a messy business). On holidays, I gravitate to where there is water: oceans, lakes, rivers, pools, drinking establishments. Call me a water diviner, if you like – I do look divine in a swimming costume. So when in Budapest, which is famous for its thermal spas, what do you think I most wanted to do? Go on a spa crawl, of course. There are a number of impediments to doing a spa crawl, though. One is you need at least a week, to do it, or two weeks to do them thoroughly. According to the weird people who like to count these sort of things, the city has 123 natural hot springs and drilled wells which pump out 70 million litres of thermal water every day. 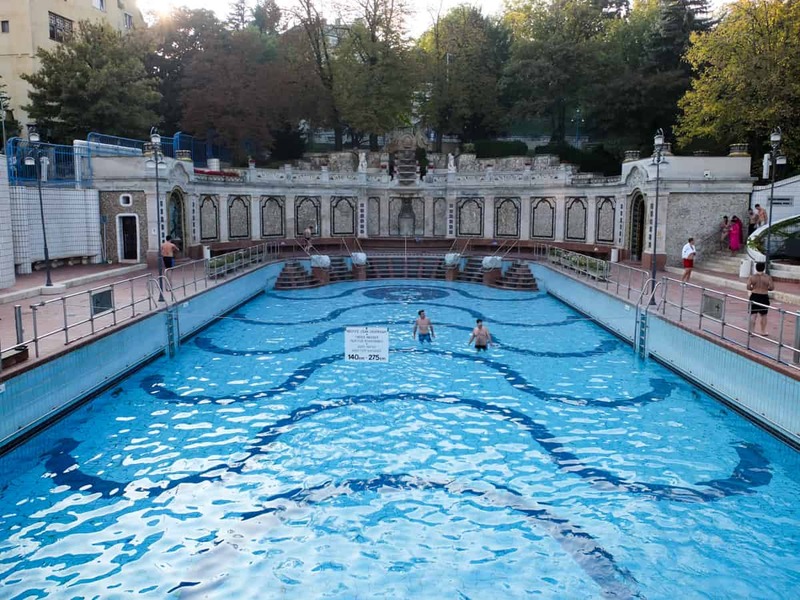 The Budapest Spas website lists the dozen-odd most alluring thermal baths and “beaches” – great outdoor pools. The decoration is superb at Gellért. A first-time visitor can’t go to Budapest and simply lounge around in spas, however. The Hungarian capital is an amazing city and there is so much to see: The Citadel, Buda Castle, Fisherman’s Bastion, the massive Hungarian National Gallery, Matthais Church, Saint Stephen’s Cathedral, the Houses of Parliament, the Opera House, Heroes’ Square, Vajdahunyad Castle … I’ve visited the city twice and feel like I have barely scratched the surface. A third factor is the weather: those outdoor pools look great on a glorious summer day, but when Budapest sinks into a spell of wet, chilly gloom it’s a different story. The dome in the foyer area. 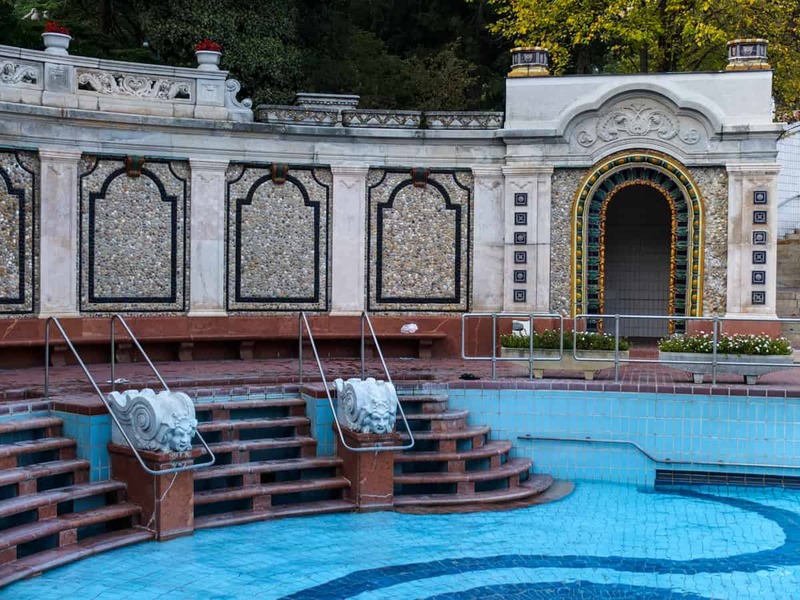 Still, even if time is short and the weather is against you, there is one spa that you must do, the most glamorous of the lot, the Gellért Thermal Bath. It has, after all, graced the cover of the DK EyeWitness Travel Top 10 Budapest guide. I was under the impression that there was only one pool at Gellért (the one on the aforementioned cover and pictured at the top of this post), but once you pass through the elaborate foyer and entry gate you discover it is actually a maze of a dozen pools. They include: four thermal spas of 35, 36, 38 and 40 degrees Celsius; two immersion pools of 19 degrees; the main indoor bathing section comprising a big pool (26 degrees) and another thermal pool of 36 degrees. Outside there is a big wave pool of 26 degrees, and an “adventure pool” of 36 degrees. In other words, it’s Hippo Heaven. My visit occurred in mid-October, and the weather was still warm enough to merit going outside, although most of the bathers were huddled together in the smaller warmer “adventure” pool. Judging by the languages I could hear, there were holidaymakers from all over the world. None of them seemed to be having adventures, unless chatting face to face is considered adventurous nowadays in the digital age: the men were mostly young, bronzed and buffed, the women curvy and confident in their of bikinis. Perhaps their adventures would come later. The wave machine had been turned off in the bigger outdoor pool (pictured below) but once I dive-bombed in, that all changed. The place rocked! Here it was great to thrash around at leisure underneath the pale blue sky and to absorb the intricate details of the surrounding decorations: the white marbled gargoyles on the shallow end steps and beautifully tiled archways on the surrounding walls, among them. Bernard O’Shea visited Budapest at his own expense. More information: spasbudapest.com. and gotohungary.com. Photos © Bernard O’Shea.